In my last post i talked about our network as a small and stable yet dynamic family. I can find many of these qualities in the community of the EYA. Although in a different way. It is large and shrill and posh and everyone seems to be busy being the next big Start-Up CEO. In an interesting workshop, conducted by two wonderful friends from Syria, my group amongst others noticed that we all lack a significant resource: Time. For ourselves. I want to compare the well organised and tight festival program with a river steadily and strongly flowing. Sometimes you can find people floating next to you at the same velocity. I had many such encounters throughout the last two days. And although it sounds stressful, in fact it has always been energetic and pleasurable. As well interesting and demanding. Personal background stories mixed up with social business models. Example: My dear friend Attila and i just met again after one year and had to catch up in a 10 minute coffee break which ended up having a conversation about how the factor “efficiency” can affect design in a very negative way. When the bell rang we were still standing in line for coffee but almost forgot the river running towards the next workshop. 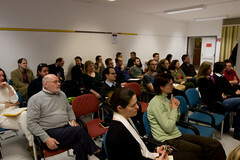 In the afternoon the winning teams presented their projects to the jury and the festival audience. After last year’s experience i knew in advance that our mission to choose the overall winner would not be easy. The rules for each contestant: exactly 3 minutes of presentation time and 3 minutes of Q&A by the jury. 17 projects and about 2 hours later we were all pretty much filled up with inspiring ideas … and we were exhausted. The contestants were free to spend a nice evening in Graz. For the jury the work just started at that point. At around 11pm and after a we discussed the presentations and projects we finally elected the overall winner. “Erase All Kittens” confused with it’s name but also won the hearts of many people in the jury and the audience immediately. As they state on their website: “E.A.K. is a revolutionary, online game that provides kids aged 8-14 with knowledge of both computational thinking and professional coding languages, to effectively prepare them for 21st Century degrees and careers.” Not only it was clearly the most innovative project but it was also the best presentation: I had no struggle at all to understand the concept and their goals within the 3 minutes (almost no questions needed). It amazes me how the team combines the logic process of coding with the ease of playing a fun game about kittens. Here are the winning teams of the 9 different categories. In a big evening ceremony on the next day the winning teams were honored by officials and celebrated themselves afterwards. We all know how important partying and dancing is. Sometimes it feels like shaking of the weights of hard work. Especially after so many hours of conceptualizing, creating, designing, coding, calculating, marketing etc. I congratulate and thank the teams and the organisers for making it once more a special experience! 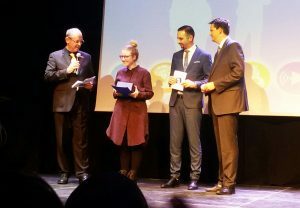 The European Youth Award is a wonderful source of inspiration and gives insights into the young social entrepreneur and start-up scene. At ICT4D.at it is nice and helpful to be part of this international network. I talked to several people about our work as an NGO and there might emerge collaborations in the future. What i definitely know though is that i will be happy to spend some quality time at the EYA again next year. In the current issue of brand eins (already mentioned in an article on design in and for LDCs) the social marketing organization PSI is portrayed. a nonprofit organization based in Washington, D.C. that harnesses the vitality of the private sector to address the health problems of low-income and vulnerable populations in more than 60 developing countries [from the PSI homepage]. The organization especially tries to tackle health issues in less developed countries – e.g. malaria, HIV or tuberculosis, but also tries to operate as economically successful as possible. Depending on the most effective way of business, PSI cooperates with local entrepreneurs or health institutions to market their products and promote a lifestyle avoiding diseases (e.g. hygienic measures or contraception). One very innovative approach of the organization is how the success of their business is measured. By collecting statistical data and utilizing internationally accepted measures such as DALY (Disability-Adjusted Life Years = life-years that sick persons would lose without treatment), the outcome of their actions can be displayed in a comprehensive way. The “Annual Health Impact Report” of PSI shows these numbers in several graphs and is definitely worth taking a look at. Yesterday (20.1.) I was at the first SocialBar Wien at the Skydome of the Wiener Hilfswerk. The event should facilitate a knowledge exchange between IT specialists, voluntary workers, NGOs and even donors and scientists in the area of social work in general. The Austrian version is closely affiliated to the German SocialBar movement and also uses the same infrastructure. The organizer (picture to the right) was Peter Jedlicka. There were around 30 people from different NGOs and platforms as diverse as CARE, SÃ¼dwind, Rotes Kreuz, Wohnungslosenhilfe… but also interested individuals. 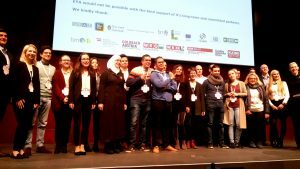 There were five presentations about topics ranging from social entrepreneurship to platforms for the coordination of voluntary work (more details here). I like the general idea of creating this kind of a platform for networking and exchange of experience – and to get to know people with similar interests. The meeting yesterday was a good start, but I have some suggestions for next time to improve the “social experience”. However, I enjoyed taking part in this event and I’m looking forward to see it evolve in the future. Also, I really liked the mixture of people attending. The next meeting will be held in February – check it out!